Motorbike and horseback are two of the most dangerous types of stunts to pull in film. 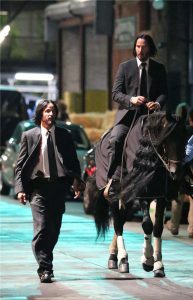 So naturally, Keanu Reeves combined the two for a dramatic scene for his upcoming John Wick 3. The 53-year-old fought off a would be motorcycle assassin as he galloped along atop an enormous black steed as cameras rolled on the action sequel in New York early on Tuesday morning. Wearing the reluctant hitman’s now-iconic black suit and tie with white shirt, the star held onto the reins with one hand as he fired a gunpoint black at his pursuers helmet. Both men were held in place by safety harness hidden from view, while the metal wires that saved them from smashing off the ground will be removed digitally in post-production. 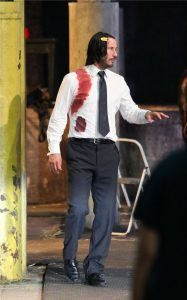 Even with the risk of death somewhat (but never totally) negated, doing one’s own stuntwork is extremely taxing on the body, if one’s body is not as ageless as Reeves’ very clearly is.